For the companies exploring for gold, a deposit that has more than one gram of gold for every tonne of earth is an exciting prospect. In fact, in our 2013 report summarizing the world’s gold deposits, we found that the average grade of gold deposits in the world is around that amount: about 1.01 g/t. Think about that for a moment. One gram (0.035 oz) is equal to the mass of a small paper clip. This small amount of gold is usually not even in one place – it is dispersed through a tonne of rock and dirt in smaller amounts, most of the time invisible to the naked eye. For some companies that have the stars align with easy metallurgy, a deposit near surface, and open pit potential, this gram per tonne deposit may even somehow be economic. It’s hard to believe that such a small amount of gold could be worth so much, and that is why great visualizations can help us understand the rarity of this yellow metal. 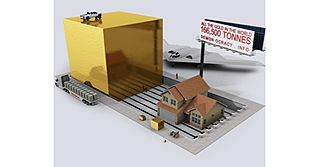 Luckily, the folks at Demonocracy.info have done the heavy lifting for us, putting together a series of 3D visualizations of gold bullion bars showcasing the world’s gold that has been mined thus far. Note: these visualizations are a couple of years old and optimistically have the value of gold pegged at US$2,000 per oz, presumably for the ease of calculations. For those interested, we have also put together a similar slideshow on the topic, showing how much gold, silver, copper, and other metals are mined each year. Smaller denominations of gold plates: 1 gram, 5 grams, 10 grams, 20 grams, and 1 troy oz of gold. Larger denominations of gold plates: 50 grams, 100 grams, 250 grams, 500 grams, and 1 kg of gold. This 400 oz gold bar, at $2,000 per oz gold, is worth the $800,000 cash beside it. The gold bar is extremely heavy, weighing more than three full milk jugs. Here’s what one tonne of gold looks like. At $2,000 per oz, it’s worth $64.3 million. Gold is so heavy that the suspension of an average truck would break if it held anymore than pictured above. Even if the truck’s suspension broke, the load of gold in the back could buy 2,660 brand new trucks at an MSRP of $40,000 per truck. Here’s 10 tonnes of gold compared to 100 tonnes of the yellow metal. This semi-truck is carrying the maximum load it can legally carry, which is about about 25 tonnes. Here there are 24.88 tonnes of gold, worth $1.6 billion. The Northrop Grumman B2 Spirit Bomber program cost $44.75 Billion for a total of 21 units built, which averages to $2,130,952,380 per unit. Shown here is the amount of gold it costs to buy one unit. Here’s the entire gold reserves of the United States government, which is 8,133.5 tonnes. Here’s the world’s gold reserves by government circa 2012. This is slightly outdated, with China and Russia both having significant increases since then. All gold mined in history, stacked in 400 oz bars. The 166,500 tonnes here is actually divided into four levels: the bottom level is jewelry (50.5% of all gold), the 2nd level is private investment (18.7%), the third level is world governments (17.4%), and the highest level is other uses for gold such as industry (13.4%). Want to learn everything you need to know about gold in about 20 minutes? Our five-part Gold Series covers everything from its rich history, supply and geology, demand drivers, investment properties, and market trends.